One of the categories for my 2017 Reading Challenge (which you can read about here) was to read a book I loved as a child. 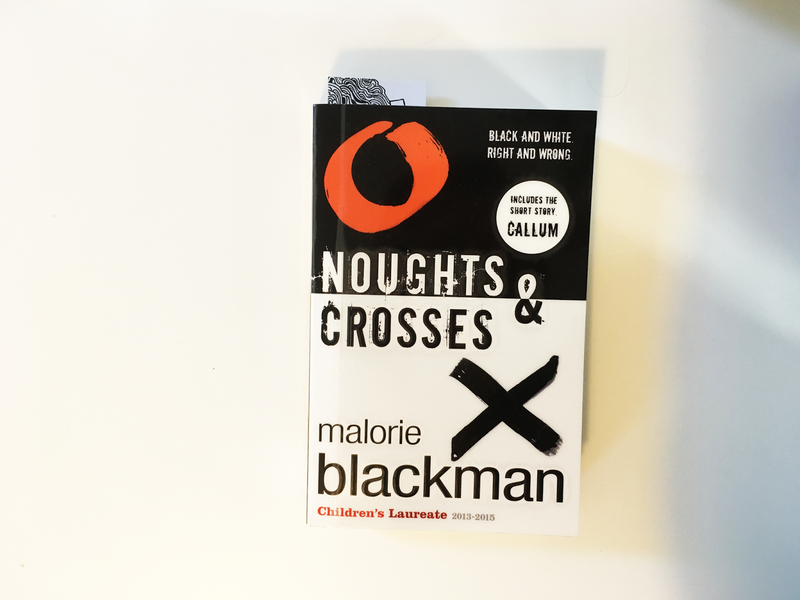 So here we are: Noughts & Crosses by Malorie Blackman. I had forgotten it was on my list until I finished my book at work and hunted through the shelves for something to read on the train home. Et voila. I had a copy of this when I must have been around 12-13 and read it cover-to-cover more times than I can count, so was really looking forward to picking it up again and seeing if it affected me in the same way it did before. Immersed in the story, I was amazed by a) how much of it I'd forgotten or b) how much I just hadn't picked up on as a child. There are some very dark subjects covered here, far too heavy for my child self to have fully understood back then, that really took me by surprise. But reading it again from the perspective of an adult actually made me really grateful that a book like this exists for children to read. The dark and serious subjects are important, and it's good that they can be covered in such a responsible manner. For those of you who don't know, Noughts & Crosses is the first book in a series by Malorie Blackman about a world where Crosses (dark-skinned people) are the ruling class and Noughts (white-skinned people) are subservient. This may seem a little heavy-handed, but Blackman writes about it in a way that just works. Sephy is a Cross, and her childhood friend Callum is a Nought. We follow the story of them slowly drifting apart as they enter their teens, going to school together as a trial to integrate children from both sides goes forward, and the eventual fracturing of their relationship, which deeply affects them as they enter early adulthood. It took me until now to realise that Noughts & Crosses was probably my introduction to dystopian literature. I would recommend it to anyone who hasn't read it before and is a fan of The Hunger Games because although nowhere near as 'action-packed', it's still very heavily focused in teenage relationships and complicated feelings, as well as more important issues such as racism and stereotypes. As a child I never read the rest of the series. Why? Who knows. But after this reread I am really urged to. I showed one of my work friends that I was reading this, which dissolved into us gushing about how wonderful a book it was, and her offering to lend me the rest of the series. I think I might have to take her up on the offer.